Rescue a man's friend from a spider-infested cave. I met a man named Beryn in the woods, recovering from an epic drinking bout at his camp. He's worried because he fears his friend Garth has wandered into a nearby spider cave on a dare. Talk to Beryn at a small camp just outside of Aesar's Web. 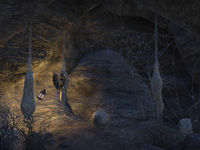 Head to the nearby spider cave and find Garth. Speak to Garth back at the camp to complete the quest. I should look for Garth in the spider cave. He might be wrapped up in one of the numerous silken cocoons strewn about the cave floor. I found Beryn's friend. I should head back to their camp to see how Garth is doing. Finishes quest I'm back at Beryn and Garth's camp. I should talk to Garth and see if he's all right.